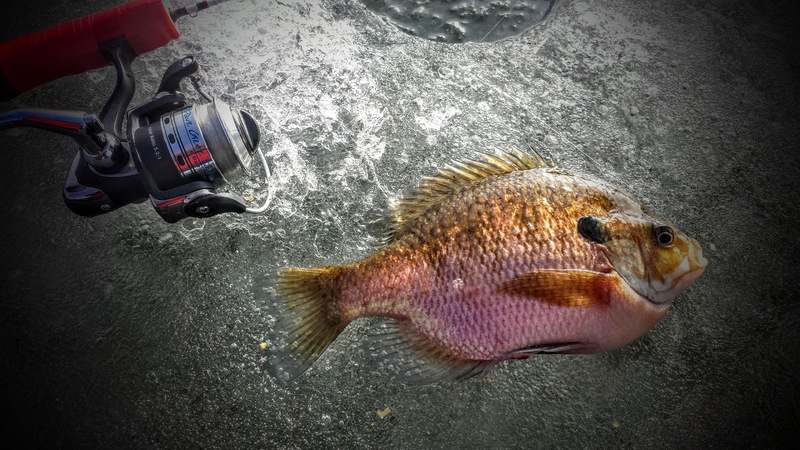 With February coming to a close, so is the ice fishing season. Each year at this time I always wonder if today was the last time to ice fish this winter. If it was, it was a fun day on the ice at Hickory Grove Lake. As the ice season winds down it is vital to put safety first and foremost when stepping out on the ice. Rope, ice picks and the buddy system are necessities this time of year. Mark Anderson and Jacy Large were able to join me on the ice today. We hit several areas and almost the entire lake was in pretty decent shape throughout most of the morning. However, the 65+ degree weather ate the ice away under our feet. By early afternoon we could see the ice changing color to the deep, dark blue color which only means that it was soaking up water and becoming weak. We had to take our time and avoid those dark-colored ice areas. Safety first, and we were able to enjoy a great day on the ice. As for the fishing, it was typical Hickory Grove at its best. The bluegills were numerous and of good keeper size. The Vexilar FLX-28s were constantly on the move checking holes for active fish. Between channel swings, flats and brushpiles we were able to have a blast chasing fish all around the lake. I was able to catch 6 different species of fish, which covers just about everything that swims at Hickory Grove; bluegill, white crappie, black crappie, green sunfish, largemouth bass, and a channel catfish. The weather was perfect, almost hot at times as we enjoyed perhaps one of the last times on the ice for this winter. 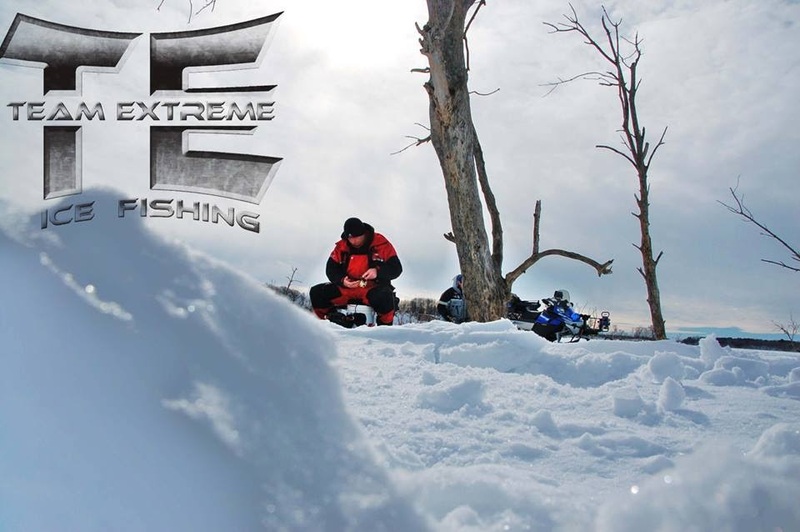 Stay safe out there, and travel north if you are looking to extend your ice fishing season. Use caution and the safety items mention previously, have fun and good luck! February 20th brought a day of wonder for me. Temperatures throughout the week were in the 30's and 40's at night and up towards 60 during a few days, to say the least Mother Nature was doing her best to melt the ice on the area lakes. I am certainly NOT ready to call it quits on the 2015-16 ice fishing season, but ultimately it has to come to an end and this past weekend was definitely a wake-up call to many ice anglers. Either way, the plan was to meet up at Hickory Grove Lake west of Marshalltown and see what the weather had done to the ice situation. 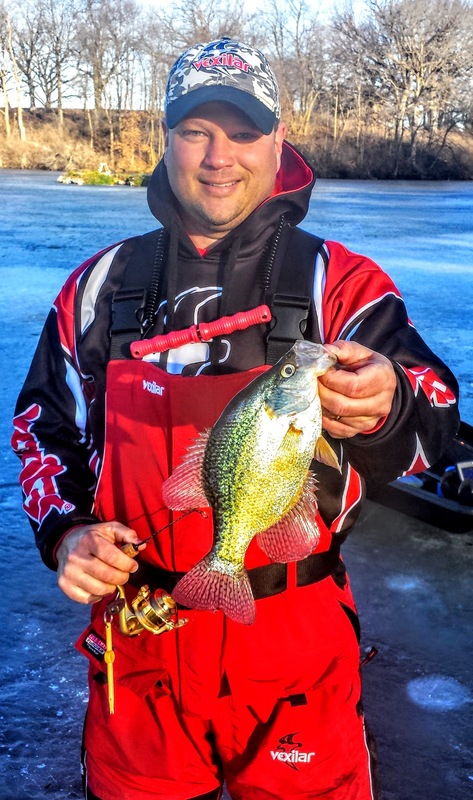 A couple friends from the Des Moines area were headed up as well to meet and catch some gills and crappies as the ice near the Metro and south is pretty unsafe. I knew the ice was plenty thick and safe out on the lake, but this time of year it can be a real chore to get out onto the safe ice. The ice nearest the shoreline becomes the weakest first and often breaks when runoff water collects near the shore. Sure enough, this was the case on this small lake. With safety picks on, and safety ropes accounted for we hit the ice for a great day of fishing. The temperature was very pleasant all day long, hanging around the 50 degree mark. A sweatshirt and insulation bibs was all a person needed to keep warm. We hopped around about half of the lake, and with no snow cover, walking was a breeze with the small amount of gear we each brought. During early and late ice if is important to keep your weight down and bring only what is necessary. I had the K-Drill in tote, rod case and the Vexilar FLX-28 to keep things easy on this day. We fished areas from 9 feet deep to almost 30 feet deep. Fish seemed to be everywhere on this day but they were fast moving. We picked off gills and a few scattered crappies most places we went. 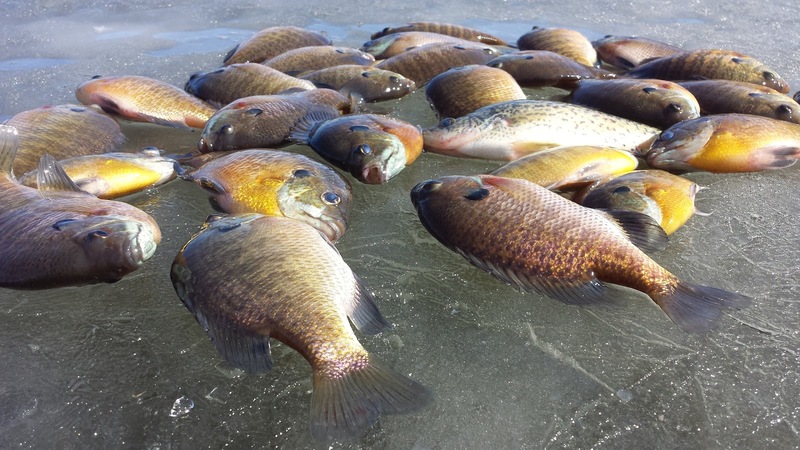 Typically of late ice and run-off conditions, a few areas had no fish present. It is important to look at water clarity this time of year when ice fishing. Run-off into the lake from tiles or creeks will muddy up areas and fish can totally stop using that area and relocate to water with better clarity, making feeding much easier. 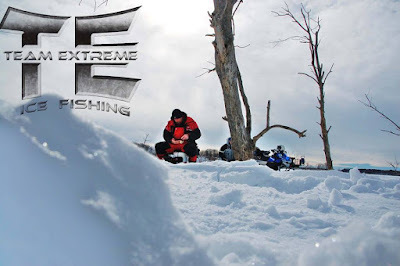 The weather was great, the company was equally good and the fishing made it a fantastic day on the ice. The days are numbered here in Central Iowa, but heading north just 50-60 miles makes a huge difference this time of year, so if you are itching to get out there, trend lightly, have your safety gear and always take friends with you. Be careful, and have fun on those last few days on the ice. The Yellow Bass Bonanza has quickly grown to the most attended fishing event in the state of Iowa. This year 255 teams participated, and even more would have but the event was full over a month ago. This event is not only to create a great atmosphere for fans of fishing, but it also contributes to local charities and brings awareness to troubling species of the yellow bass. Kevan Paul and his assistant Chris are the masterminds behind this event and all the details can be found on their website: www.yellowbassbonanza.com. Kevan and Chris are guides in the area (www.paulsfishingguide.com)and realize how fun the yellow bass are to catch, so why not plan an event to raise money for charities, promote the fishing in Clear Lake, Iowa and bring awareness to the species of fish that can harm smaller lakes in Iowa. Yellow bass are a fun fish to catch, they group up in schools and often you can one after another. They are great fighters for their size and they taste great! So what's not to love about Yellow Bass? Yellow bass are an invasive species to Iowa Lakes. They don't belong in them and can over populate a lake causing the Iowa DNR to spend millions of dollars reconstructing a lake. To help control the population of these fish the DNR has no limit on how many you can keep. For the most part on Clear Lake this has helped the lake to also provide great fishing for crappies and walleyes. More information on the yellow bass can be found on the Iowa DNR site: Yellow Bass This tournament brings together anglers from states all over the Midwest and gives me a chance to talk with anglers whom I seldom see. It's a great social event with a relaxed atmosphere that anyone, no matter the skill level can enjoy and have a great time. 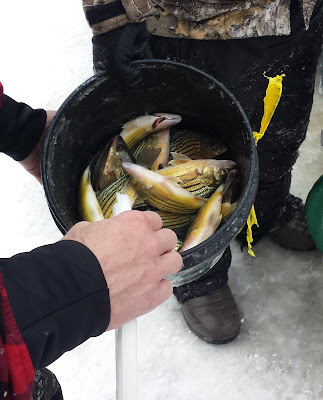 On to the event, the week was a frigid one to say the least, making the ice great but putting the yellow bass in kind of a funk. Temperatures for Sunday were topping out in the twenties but considering the wind chill the temps were well below zero. This sent many anglers inside of the shacks for the day, my partner and I were able to stay warm and stay outside all day and be as mobile as we could to catch as many Yellows as possible. The yellows seemed to moving very quickly this weekend. Typically you can sit on a hole and catch numerous fish out of a school that is passing through. This weekend was very different, a fish or two at a time was more the talk of the event. Either way, a challenge was upon us, to catch 50 Yellows in 4 hours. My partner, Jacy Large and I were up to the challenge. We placed 5th last year in the event with about 12.50pounds, so our goal was 50 yellows and heavier weight. We hopped around the lake numerous times, dropping our Vexilars down to see if any roaming Yellows were present. It is some times necessary to move often with the yellow bass, and got our 50 yellows...with about 20 more extra. We caught all of them on smaller spoons with waxworms, spike, or meat for bait. We knew the Yellow Bass were a little bigger from last year and at weigh-in we were hoping for a better weight, we sure got it; 16.37#. We were both delighted. We waited while all the teams weighed in and we ended up in 15th place, a testimony of how big the Yellow Bass are in Clear Lake. We were both very happy that we got in the top 25 once again and we beat our weigh from last year. 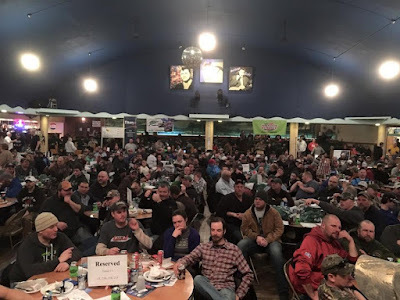 I can't say enough about how well ran this event is, from the dinner banquet the night before to the weigh-in and prizes. First-class all the way, if you have never fished Clear Lake for Yellow Bass, you still have time this winter, GET THERE! As for next year, you can bet we will back to see if we can better our weight once again. in Iowa. Mark Anderson and I once again competed and put in a few days of practice to try and locate the good sized bluegills and crappies that we would need come weigh-in time. Brushy Creek is probably the most unique lake in the state. There is a lot of water deeper than 40 feet and the entire lake is pretty covered with standing trees. Throw in some rock piles, steep banks and a river channel that swings in and out all throughout the lake. To say the least, there are so many places to look and find fish it can be overwhelming. With a couple hundred holes later and countless hours working with the Vexilar we were able to narrow things down. some lessons were learned, and really, that is what tournament fishing is all about. 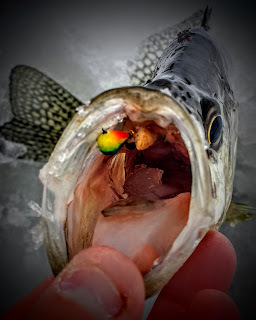 This past weekend was a break of some sorts for me during the busy ice fishing season. A break during winter just means a chance to go fishing without all the seriousness of a bigger tournament or guide trip. This past weekend started with the annual ISU Fishing Club sponsored tournament at Hickory Grove Lake. I have fished this lake ever since moving to Central Iowa and I had so many great days on the ice there. Saturday was no different as I partnered up with Mark Anderson once again to see how we could match up. 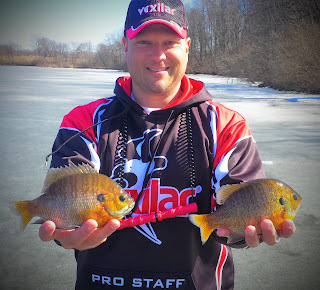 I have fished a few hours this winter at Hickory Grove and knew we would be able to catch some bluegills. We set out to hit deep brushpiles and channel breaks in the first few hours and then try different areas throughout the lake. This task is pretty easy when one person is drilling the holes and your teammate is checking with the Vexilar FLX-28. It was a good plan, but looking back we probably never should have left the first area we fished, but learning is part of the tournament experience. We ended up in 5th place out of 17 teams, which wasn't what we were hoping for, but we were right in the mix and only 0.6 pounds out of 2nd place. We caught bluegill after bluegill but just couldn't find the crappies which eventually won the tournament, as the winners had all crappies in their bag. Something to work on in the future at Hickory Grove now that the crappie population has made a good comeback...I must locate them and get back to focusing on that species in this lake. One pointer I can give any competitor that fished that day was a finesse technique that was responsible for most of the fish we weighed in. Very small jigs and plastics or small live bait was the only way to keep getting bites as the day went on. Something to remember for those bright days on the ice when the pressure is high. 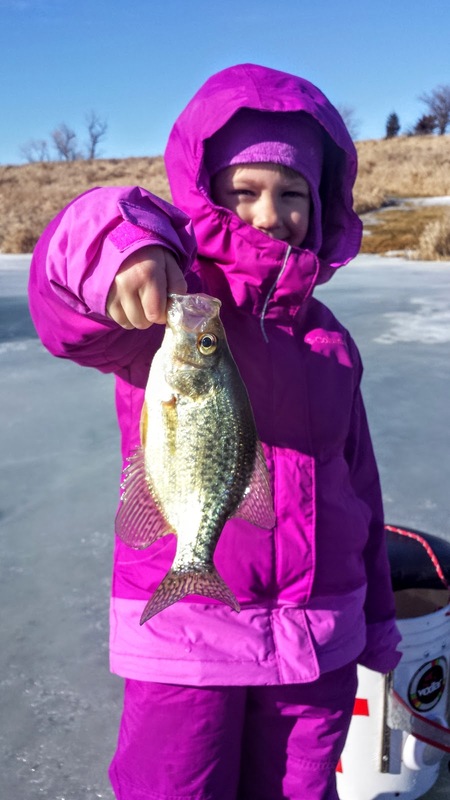 Sunday brought another beautiful day in Central Iowa, so it was time for my kids to hit the ice and try to help them catch some fish. It didn't take us long at a local pond to locate the gills and crappies. The kids just love using the Vexilars to see their jig and fish come up to it. They are so simple that they caught on in minutes. It was a fantastic day catching fish and playing on the ice. 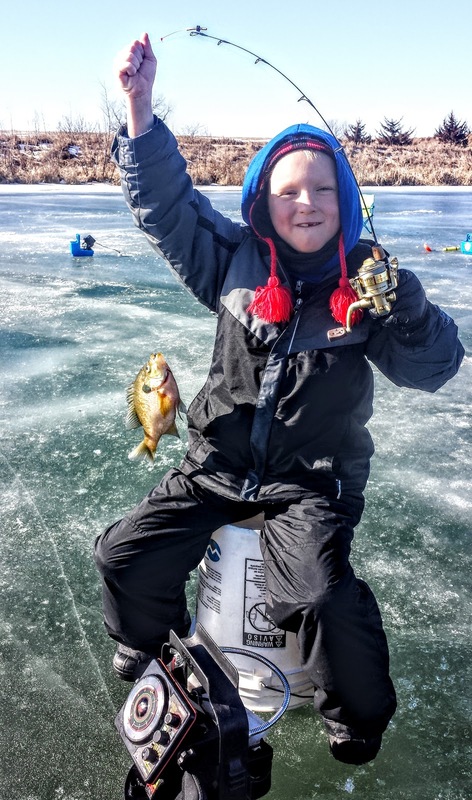 They won't soon forget their time on the ice and catching fish.